I never had much interest in visiting Nashville because it’s the country music capital of the world and I’m not much of a country music fan. However, after getting hooked on the TV show Nashville, I decided it was somewhere I’d like to visit. My sister came home a few years back raving about it and wanting to take me there. So this year we decided to have an adventure and spend five days there. The TV show Nashville did not prepare me for what Nashville is actually like. It isn’t as clean, there’s lots of homeless people and all the singing cowboys aren’t hot in snug jeans and Stetson hats. Talk about false advertising, although there was a hot bouncer who filled his jeans out in just the right way for my sister. The TV show is the rich white version of Nashville, the best version that money can buy. 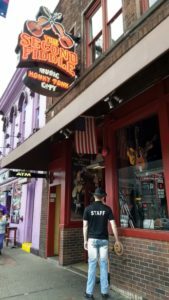 Nashville does offer a lot for people on a budget or cheapskates, like us. 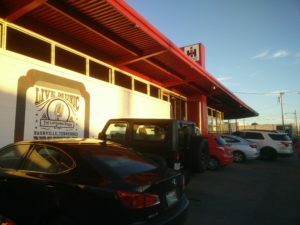 There’s so much free music in Nashville that you can go all day without spending anything on entertainment except tips. 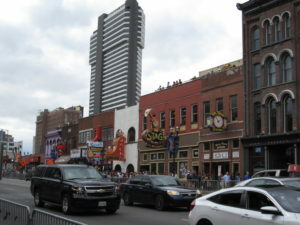 Honky Tonk Highway (lower Broadway) is an area of honky tonk after honky tonk where performers play from morning to night for free. We walked around and when we heard a singer who sounded good, we’d pop in, grab a seat, have a drink and hang out for a while. 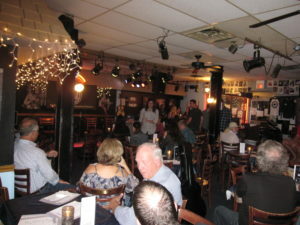 After we had enough, we’d tip the performer on the way out and go on to the next honky tonk. Even some of the venues that we needed tickets for were free. 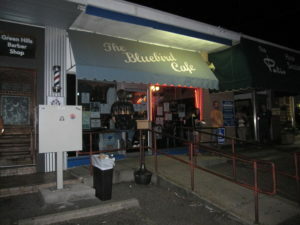 Because we’re fans of the show Nashville, one place everybody performs is The Blue Bird Cafe (4104 Hillsboro Pike). The deal with the Blue Bird is that you have to go on their website the minute tickets go on sale which is a week before the show, get put into a queue and keep your fingers crossed that you’ll get tickets. 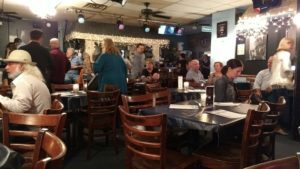 The venue only holds 90 people and sells out within minutes. Thankfully I have a job where I can do such things and Lady Luck was on my side when I was able to get two seats at a table right up front. The show was free with a $10 food and drink minimum per person. 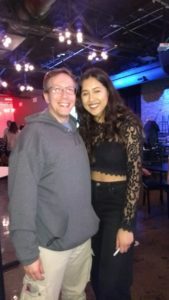 The show we went to was ten singer/songwriters who each performed 3 songs. Some of the guys were serious, some romantic and a few were down right hysterical. Yes they were all guys much to my disappointment and even more disappointing were none of them looked like Will or Deacon from the show Nashville. My favorite rule of The Blue Bird is no talking or blocking people’s views with your cell phone, it made for a completely enjoyable experience. 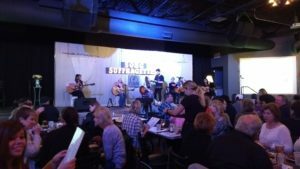 After that Sausage Fest (not surprisingly, it was my sister’s favorite night), I had my favorite night at a show at The Listening Room Cafe (618 4th Ave S) called the Song Suffragettes. 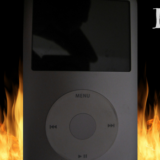 It’s a free show ($10 food and drink minimum per person) that happens every Monday at 6:00PM. Make reservations because it does sell out. 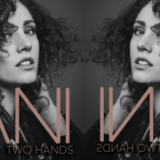 Their were five female singer/songwriters on the stage at the same time taking turns performing songs, that night they were able to do four each. Each Suffragette had their own unique sound. Bryce Drew was my favorite with her blend of country pop. Again they had a rule about not talking during the show which the audience respected. 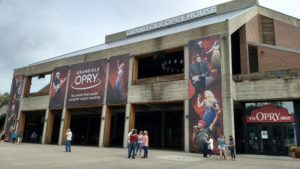 Unfortunately the audience wasn’t as respectful at The Grand Ole Opry (2804 Opryland Dr) but we had to go to a show there because it’s The Grand Ole Opry. Those damn tourists ruin everything. The seating is pew benches. We ordered our tickets far enough in advance that we could pick our seats in the front row of the balcony so we wouldn’t have heads or cell phones blocking our view. The show was broadcast live on the radio and they had eleven various performers doing a couple songs each. Again mostly older men but my favorite performer was Maggie Rose (who was also a Song Suffragette) who came out in an outfit like Olivia Newton-John’s tight black cat suit at the end of the movie Grease but instead of wearing a pink jacket, Maggie Rose had one made of gold sequins. Nashville loves it’s bling. 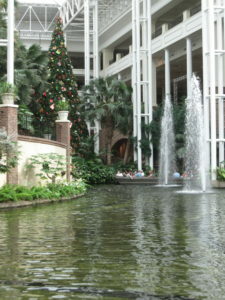 Before and after the show we went next door to the Gaylord (with a name like that, how could I not go in) Opryland Resort & Convention Center. It’s this massive resort that is so big that we got lost a few times. They have restaurants, stores, indoor gardens, fountains and a river that they give gondola rides on. They already decorated for Christmas because they need a few months to prepare. 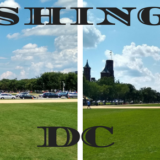 We were able to walk there from our hotel but if you drive there, parking is $29. 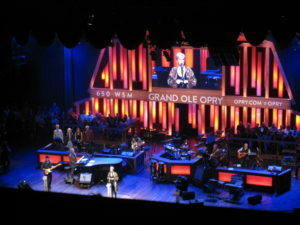 It’s definitely worth the trip if you’re going to go to the Grand Ole Opry anyways. If music isn’t your thing, Nashville isn’t really for you. However, if you’re in need of a musical break there’s a park a few miles from downtown called The Parthenon (2500 West End Ave). It’s a replica of The Parthenon in Greece. There’s a whole history behind it which you can Google since I wasn’t there to learn, I just like to look at pretty things. 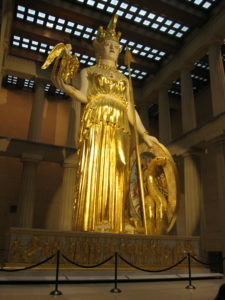 The park has a mile long walking path and inside The Parthenon is an art museum with some rotating exhibits as well as a permanent 42-foot statue of Athena upstairs. The artist Camille Engel had a temporary exhibit there that blew me away. Her paintings were so realistic I thought they were photographs. Admission is only $6.00 for adults and $4.00 for kids and seniors. 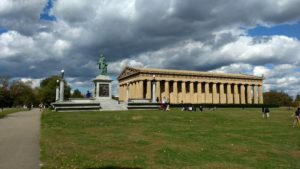 If The Parthenon is a little too high brow for you, then you could visit my favorite museum in Nashville, Cooter’s Place (2613 McGavock Pike B). 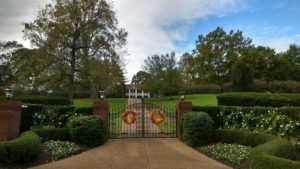 It is a museum for the TV show The Dukes Of Hazzard opened by none other than Cooter himself, Ben Jones. 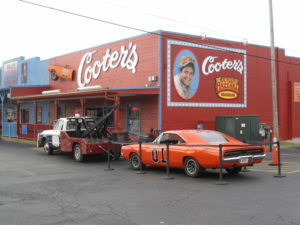 It’s free to get in but you can pay an extra $10 to get your picture taken in Cooter’s tow truck, Roscoe’s police car, Daisy’s jeep and the Duke’s General Lee. 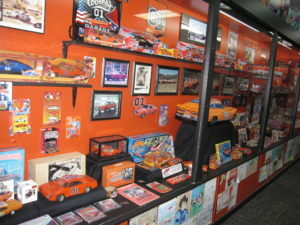 It’s not only a museum but a gift shop as well for all your Duke’s Of Hazzard needs. My sister bought two “I (Heart) Daisy” t-shirts for my nephew and his fiance who have a dog named Daisy. The shirts were $9.99 each and she had a 10% off coupon. The bill came to $23 and when my sister questioned the Cooter impersonator behind the counter why it was so high and if included the coupon, he responded that it was due to tax. Doubting that, I started laughing so I needed to leave. When we got outside, as soon as I could breathe again, I explained to my sister that she just got “Cootered” in Nashville. 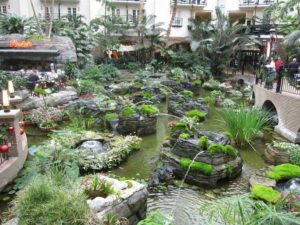 We stayed at The Inn At Opryland (2401 Music Valley Dr) which was a nice hotel that was located within walking distance of The Grand Ole Opry, The Gaylord Opryland Resort & Convention Center, and Cooter’s. It wasn’t close to downtown and we didn’t rent a car so we Ubered everywhere. Uber was the way to go because Nashville drivers are the worst, we witnessed two accidents where the cars were totaled just in the few days we were there. 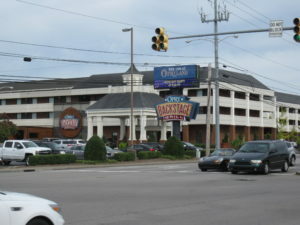 Next time I’d stay downtown where pretty much everything is and I’d only Uber to the airport, The Grand Ole Opry, The Parthenon and The Blue Bird Cafe. The rest was within walking distance or able to be reached by public transportation. Nashville definitely is The Music City and, in my gay opinion, it’s a great place to spend a long weekend but a week would be too long. By the fifth day I was ready to head home. However I used all my luck getting those Blue Bird Cafe tickets because I found out too late that Dolly Parton was doing a show the night we flew out. Nobody is more Nashville than Dolly Parton, The Queen Of Sequins. So I’d of liked one more night but I’ll just have to be satisfied with the drive-by of her house that we did on a bus tour we took. Dolly, I’ll see you next time!